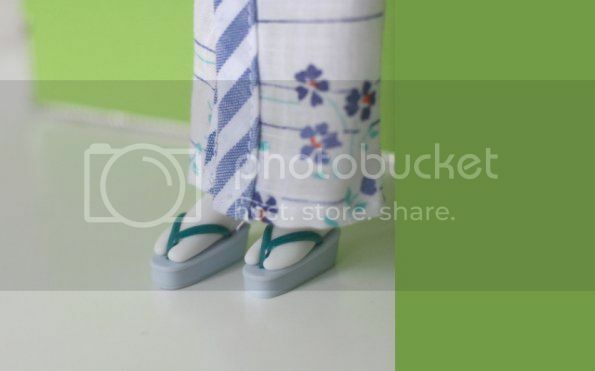 I couldn't resist making Perty a kimono, especially after picking up these adorable Blythe sized Geta sandals and Tabi sock combo (Japanese flip flops with special toe socks) from Junie Moon in Tokyo. 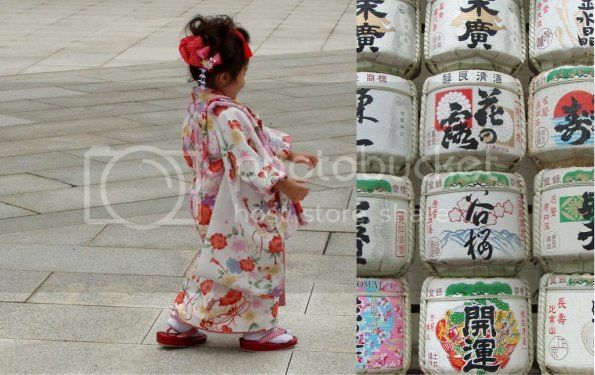 It's technically a Yukata as it is made of cotton for informal wear. 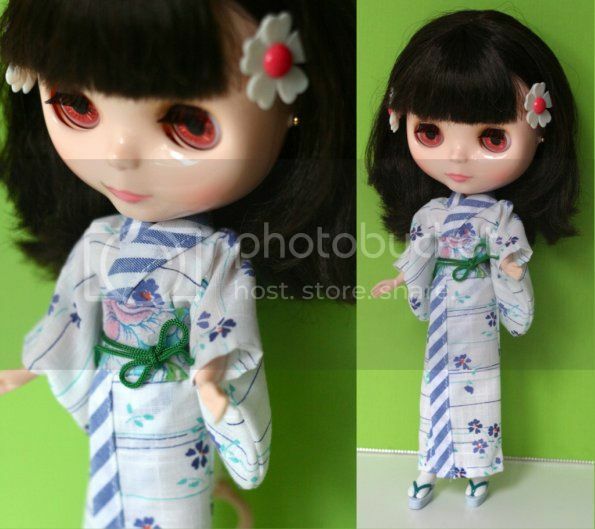 I used some of my fabric scraps, and fittingly, I think the fabric I used for the kimono was a vintage Japanese cotton. 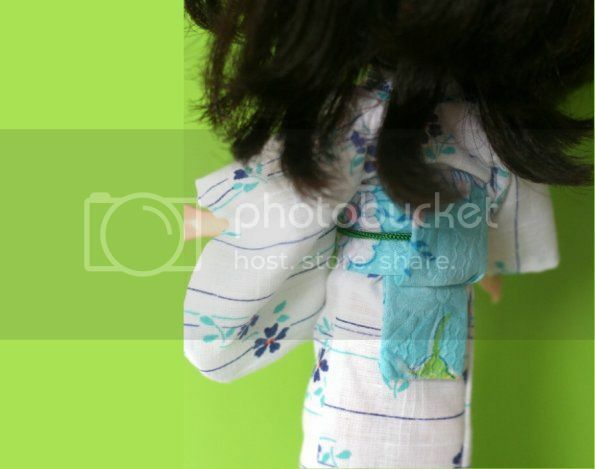 I love using my scraps for making dolls clothes. This was the pattern I based it on, but I had to modify the back and neckline as the back was a little narrow. The measurements were a bit hard to read so I just improvised. It's not an accurate reproduction as ladies' kimonos have open sleeves under the arms (men have closed sleeves, aren't I a fountain of knowledge! ). I'm particularly pleased at how cute her little Obi sash looks, fastened with velcro to make dressing a little easier. What do you think, cute yes? 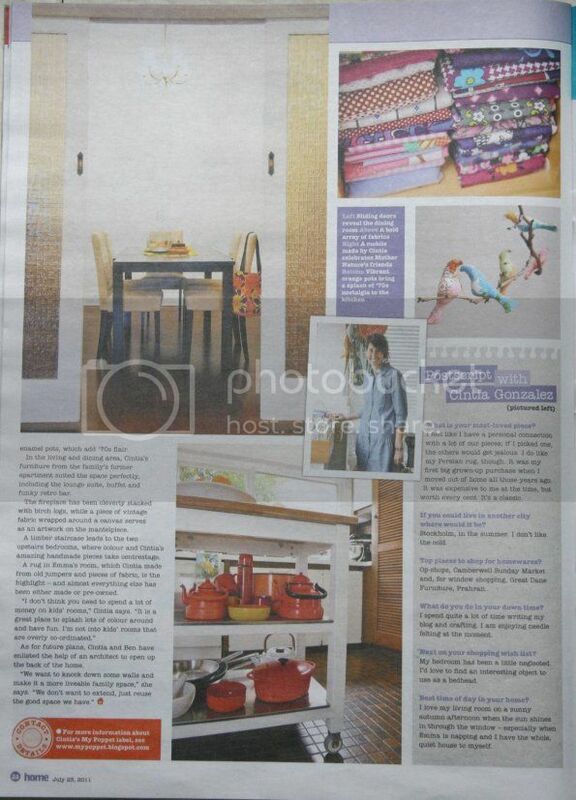 For those that don't live in Melbourne and have asked to see my home feature in the Herald Sun HOME magazine last sat (23/7), here it is. It's a bit hard to read the article from these pictures so I have uploaded some close-up shots on flickr - link here. As you can see Emma has nearly photo bombed every shot! I wish my house still looked this tidy. Unfortunately it has descended into chaos, but at least I have proof that it once looked good. I'll need another photographer to come around just so I have the motivation to tidy up again. It's been a little over a year since I closed the bricks and mortar side of my business, and I've been reflecting on it for a while, thinking about how my life has changed since then. Looking back, and without realizing it, I was super stressed out, the pressure of trying to make a business succeed in tough economic times was really making me unhappy. I didn't realize that then of course, but I did know that resenting your child for taking up precious work time was not a healthy thing. With hindsight it's easy to see that this was the right decision to make, but at the time I was really heartbroken. I kept all of my shop fittings because I thought I'd open another store down the track, but now I just laugh at how silly that all sounds. 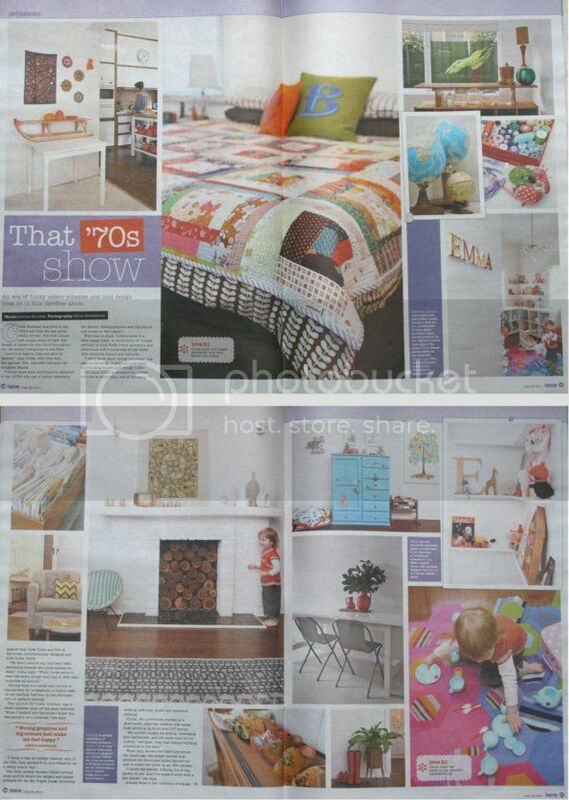 When I sold off my hangers and used the shelving in Emma's room I felt lighter. I have a few mannequins and a POS/till in the garage that will go soon too, and then it will be final, I am a blogger and internet retailer now. Yes, blogger first. It's now how I describe myself to people when they ask what I do. Since the b&m shop closed I have been posting about 5 times a week, that's at least 10-12 hours of work weekly, when you factor in photography, editing and actually writing the post, more if it's a tutorial. So it's like my part-time job. The e-shop takes up all the rest of my spare time. But why work doesn't feel like work anymore, (most of the time anyway), is because it fits in around my life. I can choose the time of the day I want to sit in front of my computer and upload stock or write a tutorial, I have that choice and it feels good. Another choice that I feel has really empowered me, is the decision to take sponsors for my blog. What ever your feelings is topic may be, (I know there has been a little controversy out there in blogland of late) I like that I am now "officially" a professional blogger. My blog has always been a part of my business and now that I am spending so much of my energy working on it, it's logical that it should earn me an (extremely modest, haha) income too. Mr Man was 'very impressed' when my first sponsor came on board, it was the first time he'd said that about my blogging ever. It's funny how men think that nothing is worth doing unless you get paid - but that's a whole different blog post. So who knows how things will be in another year or two down the track. I'm interested to do my taxes and compare this financial year to the last, I have a feeling that I'll be doing better than my (minus) -$890 profit for the previous tax year, hopefully my accountant will be 'adequately impressed' as well. 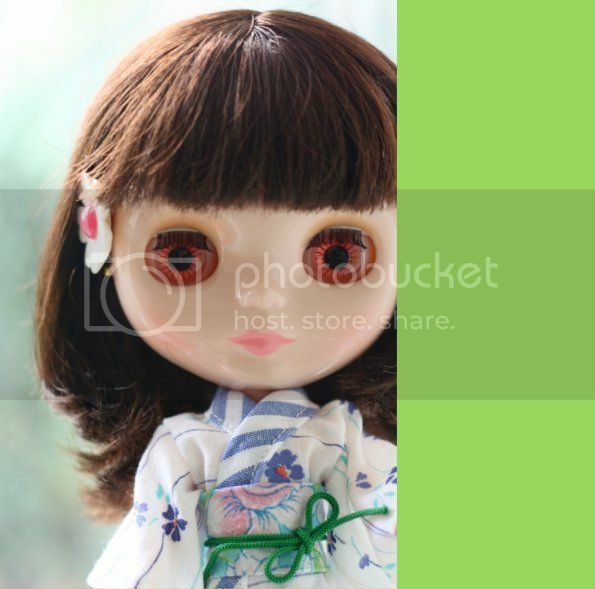 I've created a video tutorial to show you how you can use the free features in Picnik.com to create and Instagram style picture, and learn a few handy tips along the way. I'd love to hear your thoughts, and please feel free to leave a comment with your questions and I'll try to answer them asap. Well now you know what I sound like. 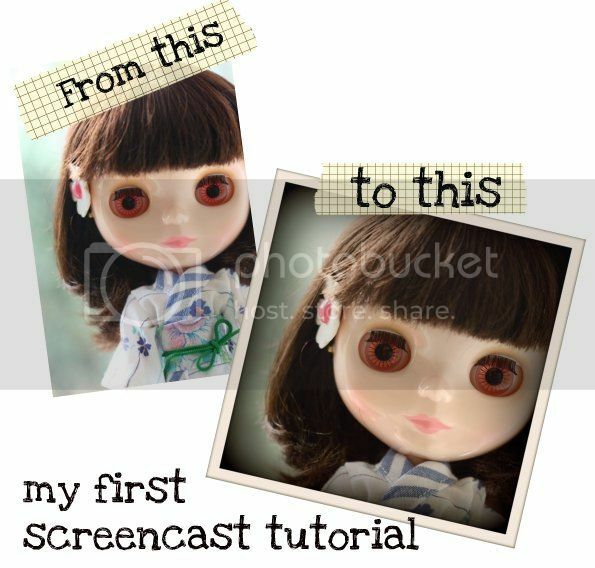 I'm planning a few more of these picnik tutorials, and am happy to take requests. After encountering these classic Dutch boots in Europe, Sally from Fawn & Fox loved them so much that she became the exclusive Australian distributor for them. Now Fawn & Fox has expanded to include a homewares range from San Fransisco and a beautiful children's' knitwear range from Denmark. I must say that Sally has immaculate taste and an eye for quality, everything stocked by Fawn & Fox has such a timeless feel. Now for the super exciting bit. Sally has been so generous and offered me this gorgeous Esencia Ribbed Jumper to Giveaway to one lucky reader. (pictured below available in sz 1-6) This prize is valued at $140 and is really stunning. All you have to do to be in the running is pop over to the Fawn & Fox website and then leave a comment here telling me what you like the best from their shop, as well as a few words about what reminds you of a happy time in your childhood. It can be as simple as a pair of red gumboots. Just one entry per person please, we want every one to have an equal chance. Sally and I will pick our favorite answer from all the comments. Thank you Fawn & Fox for being such a great sponsor, as a way to say thanks, be sure to tell your friends about this great Melbourne based company, and pop over and like their facebook page too. The fine print: competition closes Tuesday 2nd August 7pm EST. Winner will be chosen by a judging panel (Sally and I - not randomly) and announced on the blog on August 3rd. Winner will also be notified via email so please make sure you have e-mail enabled on your comments or leave an e-mail address in your comment (entries with no e-mail contact will be void). Giveaway is open to Australian residents only. Even though we'd love you to become a 'Liker' of our facebook page, entry is NOT conditional on becoming a 'liker' of the My Poppet or Fawn & Fox Facebook business pages. This giveaway is not affiliated with facebook in any way. Emma has been super obsessed with scarves of late, it's been a bit chilly in Melbourne, so I thought I'd make her one out of a felted lambswool jumper (sweater) I found at the Op-shop a while ago. It had a hood, so I had a brain wave to incorporate the hood into the scarf to make it even cozier. 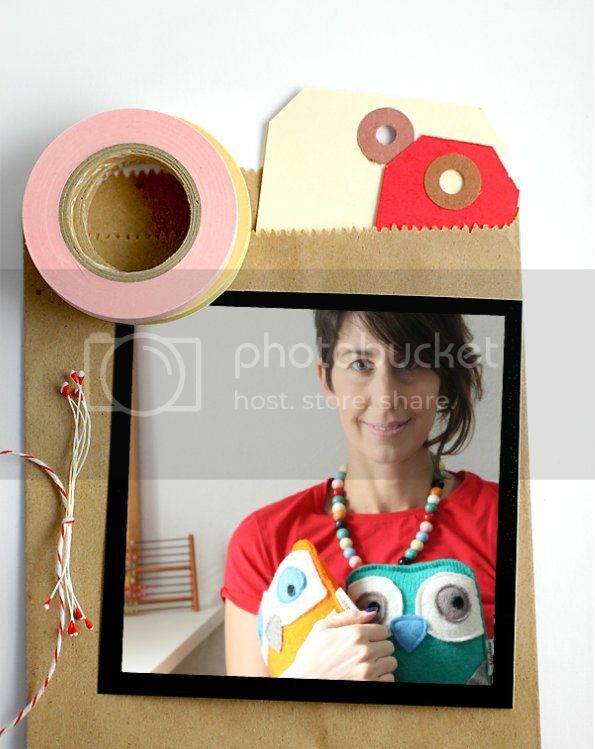 It's a pretty simple project which only requires basic sewing skills. 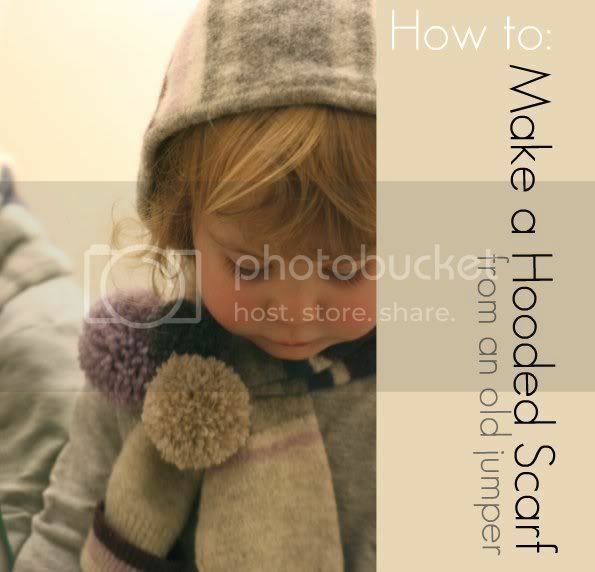 I've given some measurements for the hood at the end, just in case you haven't got a hood on your jumper and want to make your own. 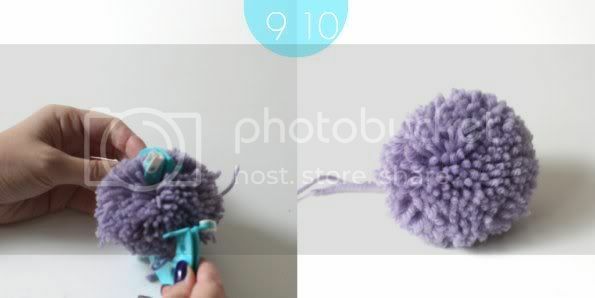 The pictures explain everything fairly clearly... Firstly, if your jumper isn't felted already, just run it through a warm was cycle to mat the wool fibers together and stop the knit from unraveling. Cut off the sleeves and hood where I've indicated on the picture above. Pictured below are the 3 easy steps. 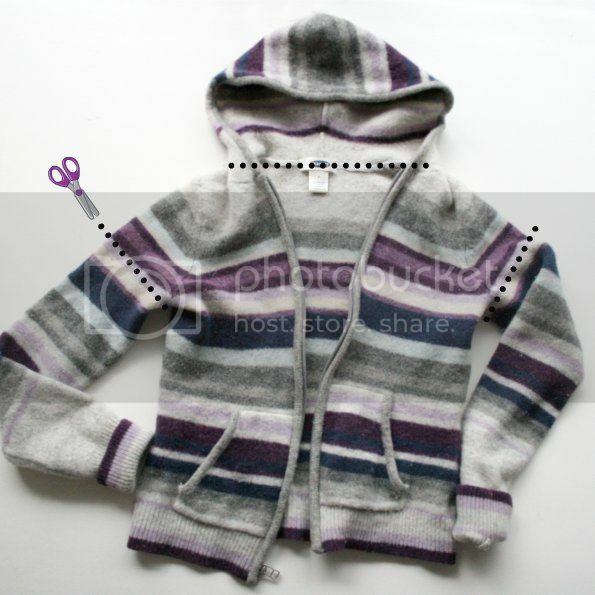 Lay out your 3 pieces and cut a slit in the sleeves about the size of the hood as indicated. With right (outside) sides facing together sew seam 1, this will sew the tops of the sleeves together. Next sew on your hood (seam 2). Lastly enclose all your seams by hand stitching the opening closed. Now you have a hooded scarf. The next steps below are optional but I think make the scarf much easier to wear. Step a. with small zig zag stitches sew around where you will cut your two slits as pictured in step b. Step c. now you can slide one sleeve into the slits to help keep the scarf/hood on. This would look cute on a boy or girl. I have tied Pom Poms onto the slits to make Emma's scarf even prettier. 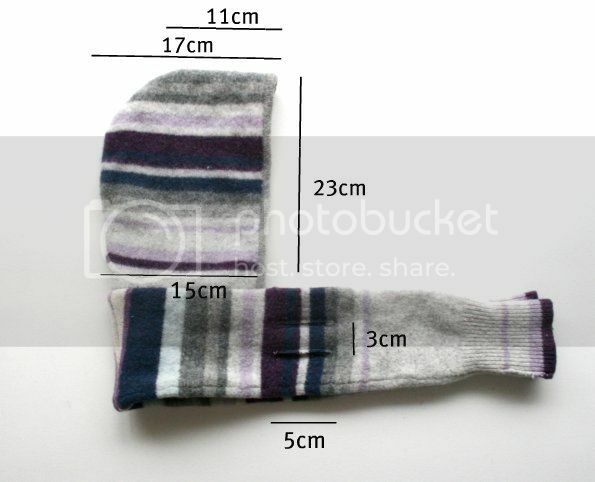 Below are some measurements to use as a guide for cutting out your own hood if you need to. 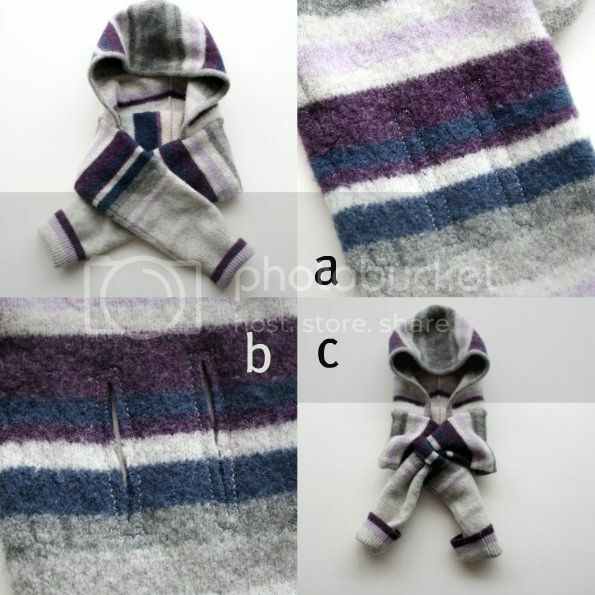 This would suit a toddler or child, for an adult size just make it a bit bigger. Doesn't Emma look so adorable in her little hood. 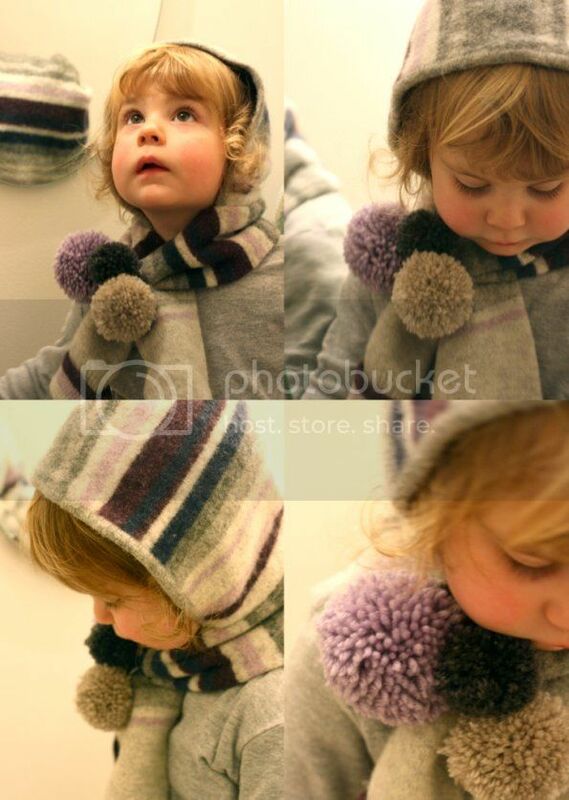 The beauty of this style is that it keeps her neck warm and you can just flip the hood back if it's not required. The slits in the sleeve keep the scarf secure. 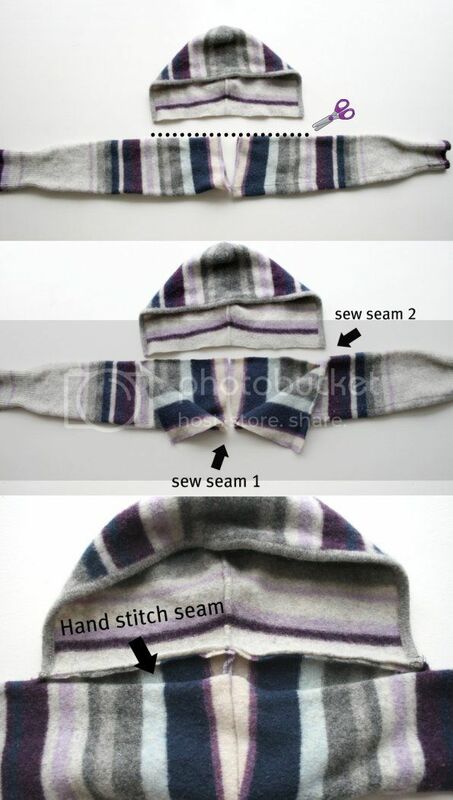 This tutorial is for personal use only, enjoy making your own hooded scarf for yourself or as gifts but please do not sell items made from this tutorial. Thanks for understanding. So many people have asked me what the favorite part of my trip to Japan was. It was all pretty amazing but the highlight was THE FOOD! 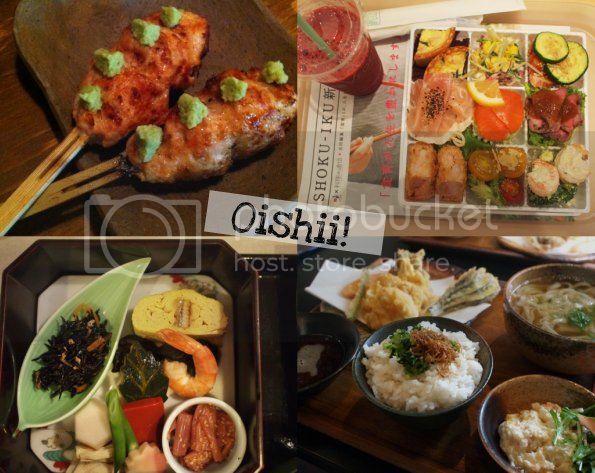 The Japanese really know how to eat, food is a real experience, and it always looks amazing. Presentation is a big part of Japanese cuisine and I felt like nearly everything we ate was a little work of art. And apart from a few unexpected flavours and textures, everything was quite delicious. Skewers- we went to several little bars that offered these delectable treats, they were a delicious and inexpensive snack (around $1-2 each), as long as you didn't eat too many. Mainly variations of chicken, but also mushroom, eggplant and other veggies with yummy dipping sauces. I had some sake at one of the bars and it was much nicer than I expected. Bentos- A little taste of everything, these boxes come in every food and flavour combo you can imagine, great for taking to the park for a picnic or on the train. The best place to get these were in the department store food courts but they were a little bit dearer that I expected ($15-17) so sometimes it was preferable to go to a cafe for lunch for the same money. Menu Set- It's likely every meal you order will come with rice and miso even if you don't order it or expect it to. We would often order a menu set because it was a nice way to try a few different things. Pretty food- As you can see great care was taken to make everything look beautiful. 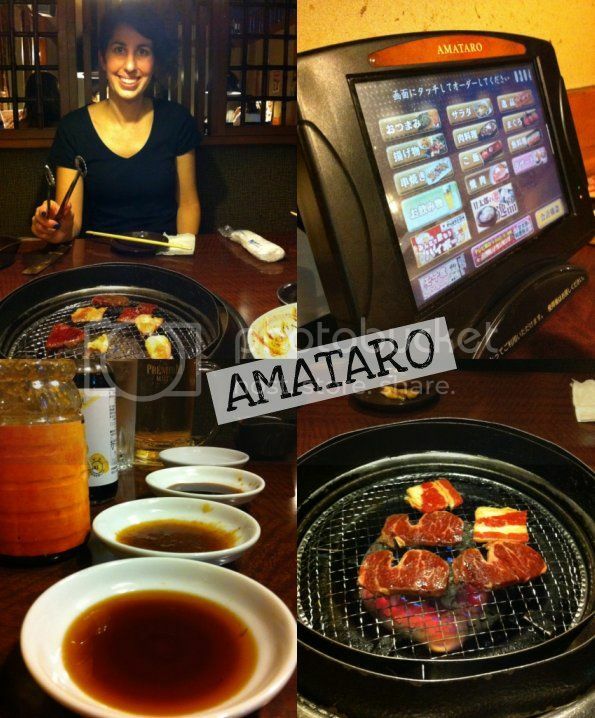 We went to dinner at AMATARO the first night of out Tokyo stay, and without really realizing we chose to sit in the DIY BBQ section. It was heaps of fun, you just had to be careful not to singe any hair. There was a touch screen display that you could order your food or drinks from but because we had no idea what we were ordering it was easier to flag down a waiter and mime what we were after. The dipping sauces there were so yummy, and we had a radish salad that was pretty rad too. Another cook it yourself type of experience in Kyoto. 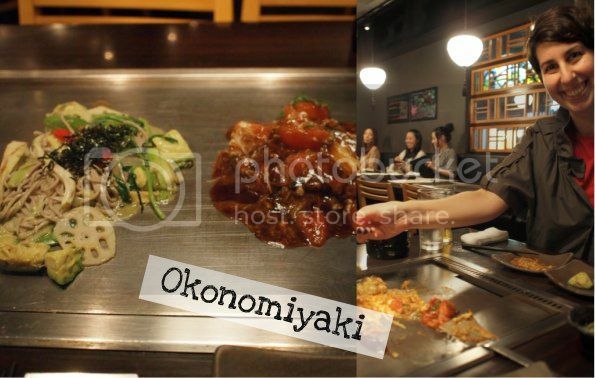 This is a modern style Okonomiyaki restaurant that we stumbled across near Kyoto train station. It was a quirky take on the traditional vegetable pancake that had some interesting ingredient combinations. The dish was served up on a hotplate to keep it warm and one had to mush it all up before eating. The avocado and noodle one was delish! 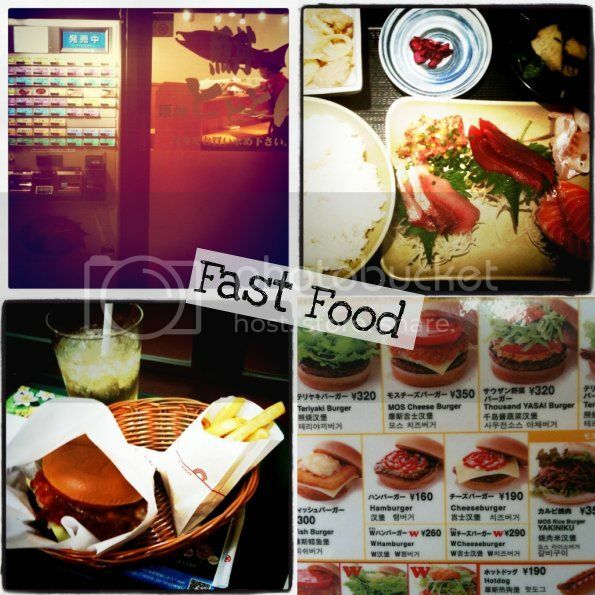 A couple of examples of fast food. On the top is a vending machine type eatery where you choose your dish, press a button and pay to get a ticket. Once you have your ticket you give it to the kitchen and hey presto you have a yummy meal without having to speak a work of Japanese. I thought I was ordering just Sashimi, but it came with soup, rice, cooked fish and pickles. The sashimi just melted in my mouth it was so tender. All this for under $10. Their were lots of these ticket style cafes around mainly selling ramen noodles or curry style dishes. Below is a fast food joint called Mos Burger. It had been recommended to me by several people and had some really odd burger choices including buns made of rice?! It didn't rock my world, but was fun to try Japan's alternative to McDonalds. I have heard that a Mos Burger is opening in QLD soon. 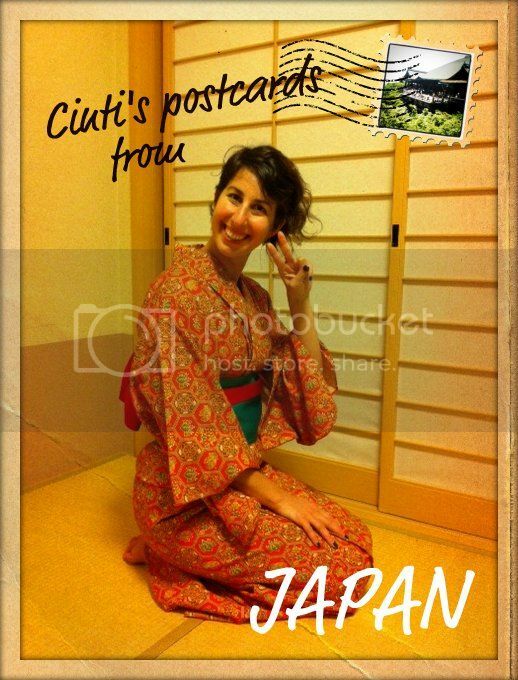 We were lucky enough to stay in a traditional Ryokan whilst we were in Kyoto. Our stay included a Japanese breakfast which changed every day but always consisted of fish, egg (omelet, poached), rice, vegetable salad, miso, tea, tofu, fruit and pickles. I quite enjoyed most of it but I must admit, silky tofu with jellied broth on top is a bit hard to eat first thing in the morning. As are Umeboshi the saltiest sourest things you will ever eat! It was the kind of thing you innocently chomp on, and then your face contorts into the most horrifically disgusted expression, sending anyone else in the room into fits of laughter. I dare you to try them... I'll share more about my Ryokan experience soon. Last but not least, Sweet treats. 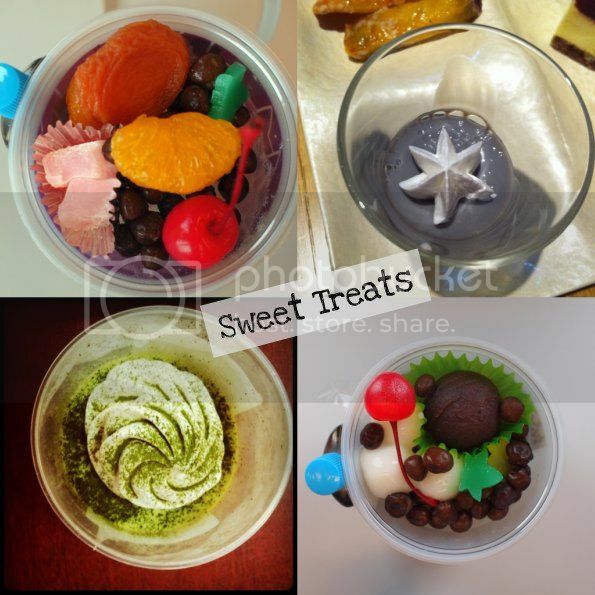 Japanese desserts come in very interesting flavour combinations and some aren't very sweet at all. Many feature green tea or sweet beans which are totally delicious. These colourful fruity cups had a variety of jellies and glutenous balls that texturally tasted a bit weird to my western pallet, they came with a little bottle of sticky syrup that you could pour over the beans to sweeten them. Congrats to those 3 lucky gals, I will e-mail you shortly to confirm your details. Thanks to everyone for your participation, there were some really creative comments amongst them all. I wish I could give everyone a prize but I'm not Oprah, haha. If you missed out on a free pair of sneaks, you can always treat yourself to a pair over at the CMUK website...You know you want to. 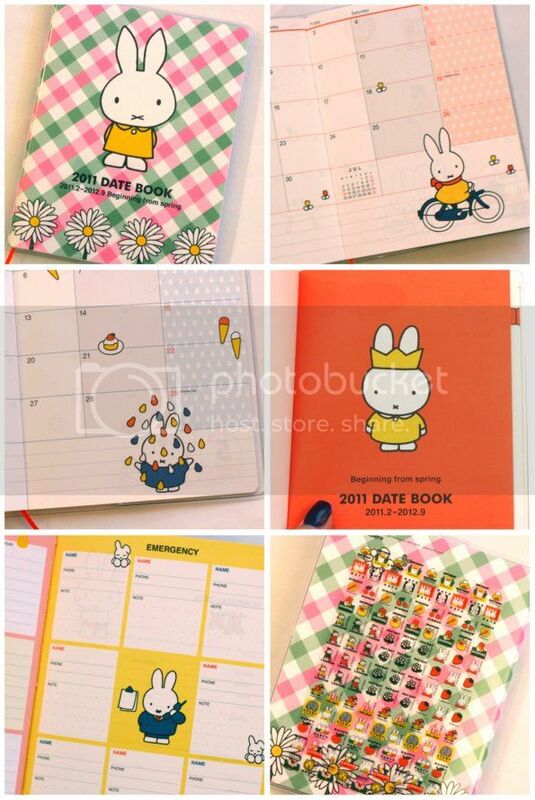 Most of you probably know and love Miffy, she is just the most adorable bunny that ever existed, yes? Well the Japanese seem to think so. 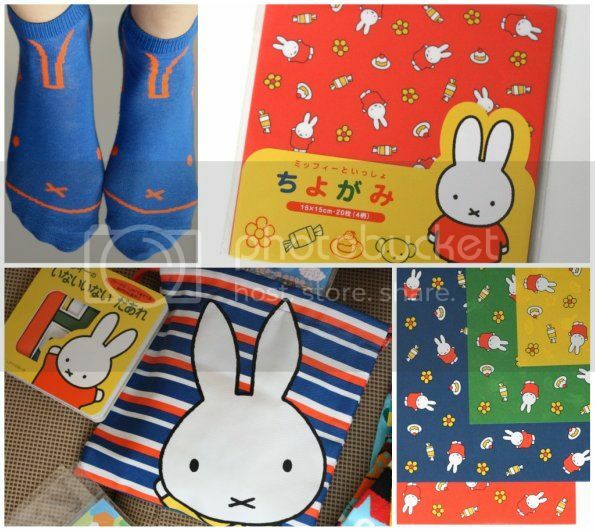 They love Miffy BIG TIME! Probably not as much as Hello Kitty, but quite a lot. She is on everything you could possibly think of. I picked up this awesome set of Pom Pom makers in Japan at the most amazing department store called Tokyu Hands. Tokyu Hands is my idea of crafty heaven, it has everything a crafty person could ever dream of wanting, and then a million things more. 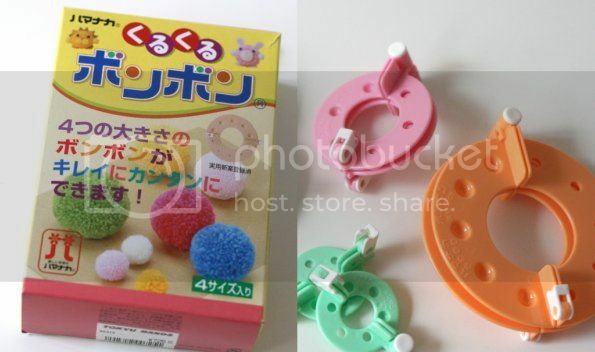 I've always wanted one of these little gadgets, because making pom poms the old fashioned way, with 2 doughnut shaped cards, is a bit time consuming. The pack came with 4 contraptions in different sizes, I thought you may like to see how easy it was to use. There are some different brands available here, I'm sure they are very similar to use. 1. 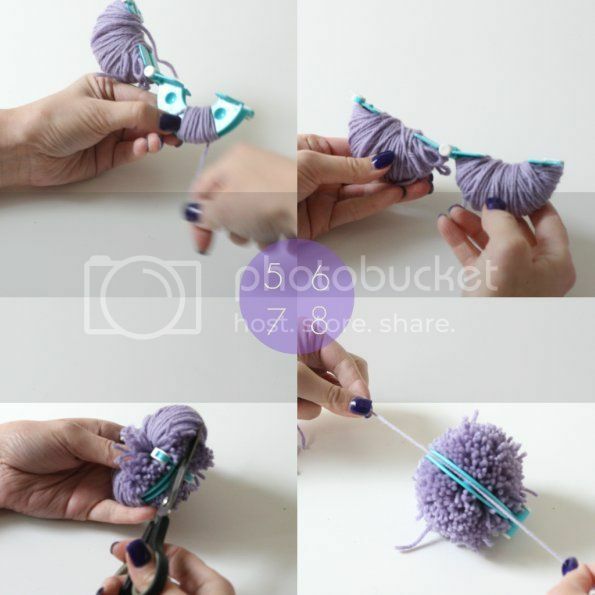 You will need your pom pom maker, yarn and scissors. 2 & 3. Match up the holes and bumps of the two halves. 4. Wrap your yarn around one half until the hole in the middle is all full (I have used a few strands of yarn to make the wrapping process a bit faster). 5. Repeat with the other half. 6. Close the two halves together and click the latch (forgot to photograph this step sorry). 7. Cut round the outside of the ring, your scissor will fit inside the groove. 8. 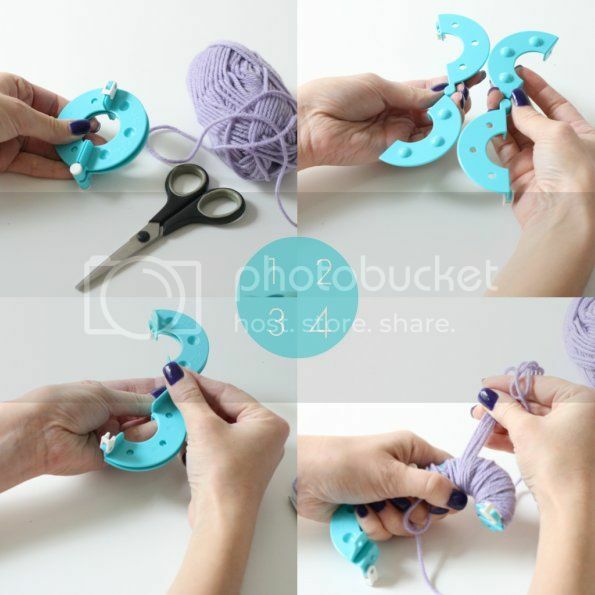 Take a length of yarn and slip it through the gap of the two rings, tie off firmly. 9. 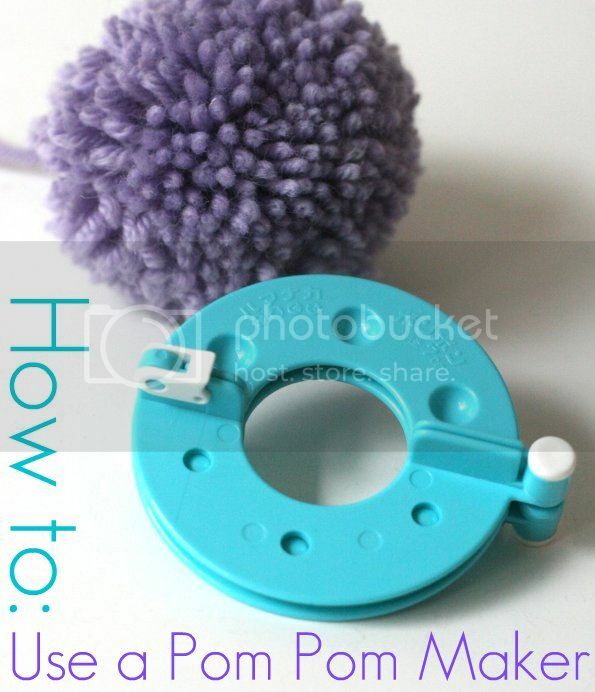 Remove Pom Pom maker. 10. Trim to neaten, and you're done! Just a few colourful snaps is all I could manage today after spending hours yesterday trying to transfer my emails to my new laptop without much success. My brain is a bit frazzled. Luckily the computer repair guy managed to transfer all my data off my dead laptop, so I have got access to it which is a relief. 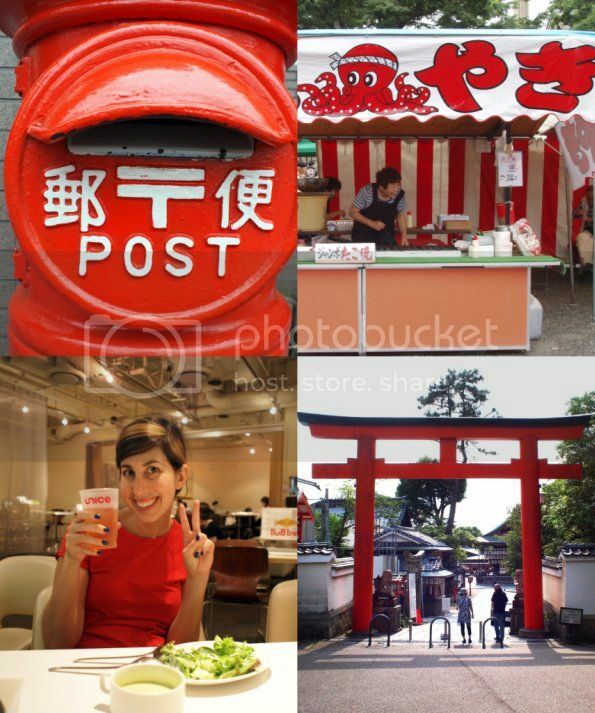 clockwise- letter box Kyoto central post office, Octopus ball stall at flea market in Kyoto, Torii gate Kyoto, Me at a little cafe/bar named Unice in Tokyo. I think I developed an addiction to socks in Japan, I came back with about 15 pairs just for me, plus about 6 pairs for Emma. You see not only are there sock shops on every street corner, every shop has a different selection, each more awesome than the next. But the real kicker is 3 pairs for 1050 yen ($12ish) regardless of style or size, long or short, so one is forced to buy 3 pairs! Every time I bought some socks, I would tell Pilgrim that they were the last ones, and not to let me buy any more, but I have an illness and I just couldn't stop. The fact is I regret not buying more pairs to get me through to the next trip there. So there were socks with 5 toes, split toes and no toes at all. 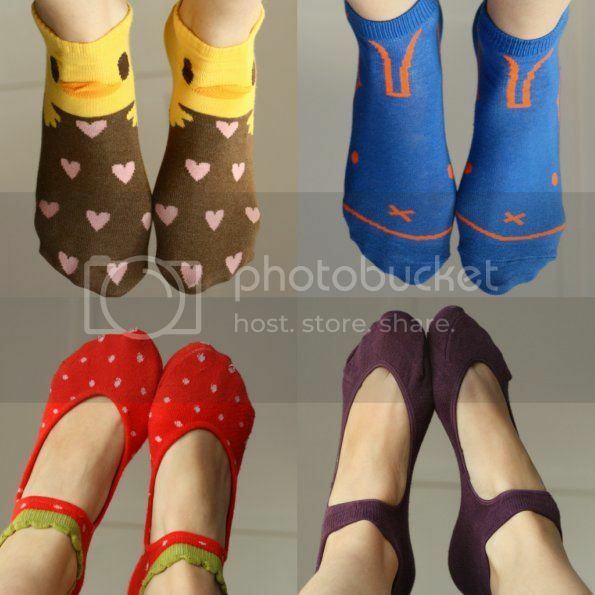 Some with fronts but no heels, some with heels but no fronts, long, short, padded, thin thick and all cute. One size fits all so those with extra large feet are out of luck. 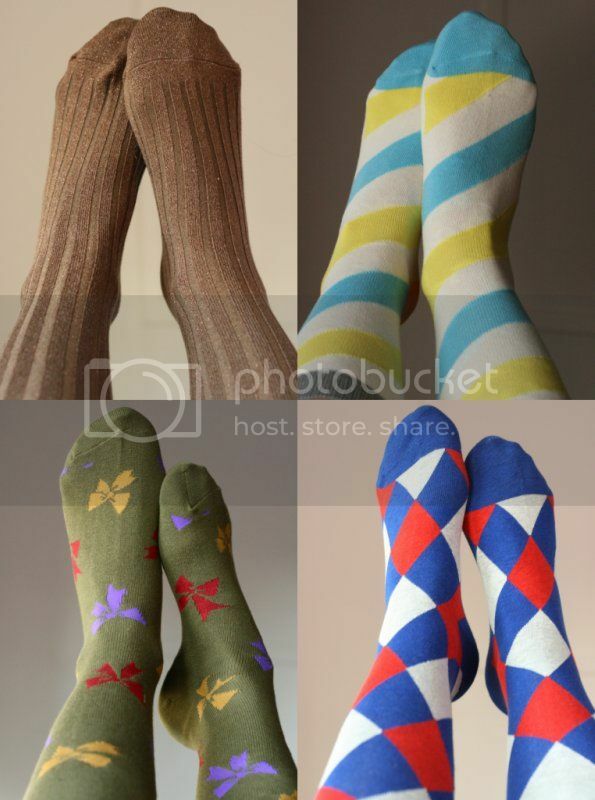 If I had to pick a favourite pair it would be the strawberry Mary Jane socks, but really I love them all. Whilst Pilgrim with her designer's eyes was absorbing all the colours and patterns in Japan, I was a little bit fascinated by Japanese bathrooms. You see the combination of heat, lots of fluid and the fact that I have the bladder which is the size of a pea, meant that I spent quite a lot of my trip visiting the lavatory. -Most public toilets are very clean but don't always have toilet paper. They are nice enough to tell you that on a sign when you walk in, except I usually read it on the way out. Hint: Keep a small pack of tissues in your handbag, there are often people handing out promotional packs at train stations. -Most Western style toilets (even in public places) are super fancy with seat warming functions and warm water jets. Why you would use the bidet function at a cafe or department store baffles me, but each to their own. Warm seats feel a bit weird, like you have followed someone that has been sitting there for a while, eew! Hint: Best not to fiddle with the knobs unless you want to be surprised. -Parents are catered for quite well, I saw a few family toilets, but most cubicles had these toddler seats in them, and a lot of ladies toilets have mini urinals for boys to use. It took me a while to work out what the urinals were for until I saw a little boy using it. -Most toilets are self flushing or have a swipe sensor rather than a button. You get so used to the automatic flush that it's almost annoying when you actually have to find a button to press. -Many toilets have a fake flushing sound button to mask your tinkle. Some will run water as soon as you sit down to mask your tinkle, it sounds like you're having a giant tinkle - it's a bit odd, I was bemused and amused. 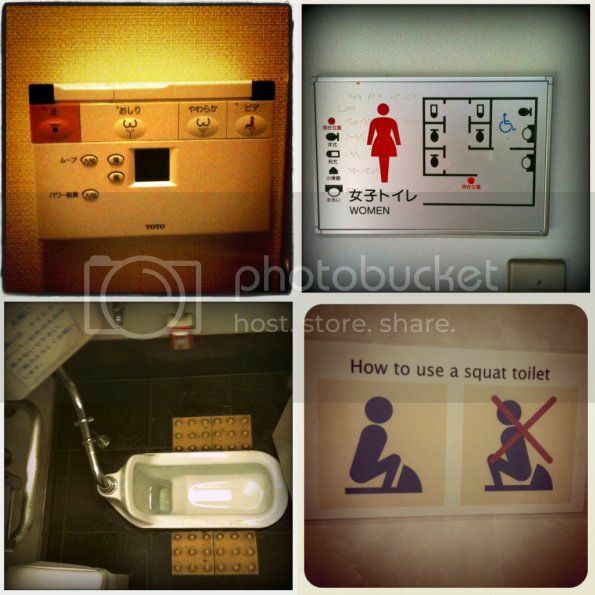 -About half of the toilets in a block are usually Japanese style (squatting), they are easier to use than you may think. Most bathrooms have a map when you walk in to identify which cubical is which, handy! Hint: Japanese squat toilets are more likely to be vacant, which means less waiting. -Most public toilets do not provide soap hand towels or hand dryers. Those that did have hand dryers had them switched off to conserve power. It's customary to carry a small hand towel (like a face washer) in one's bag for drying your hands. Hint: Buy some pretty hand towels as souvenirs, they are sold everywhere, the designs are super cute and they are quite inexpensive. I bought this bunny hand towel. It can also be used to mop up perspiration but whatever you do, NEVER blow your nose with it. Hint: Best to blow your nose somewhere private, in the toilet is best with fake flush running so no one can hear. -If you are in someones home or in a ryokan there are often little toilet slippers you are supposed to wear whilst in the toilet. Hint: Best not to wear them out, it's not a good look! 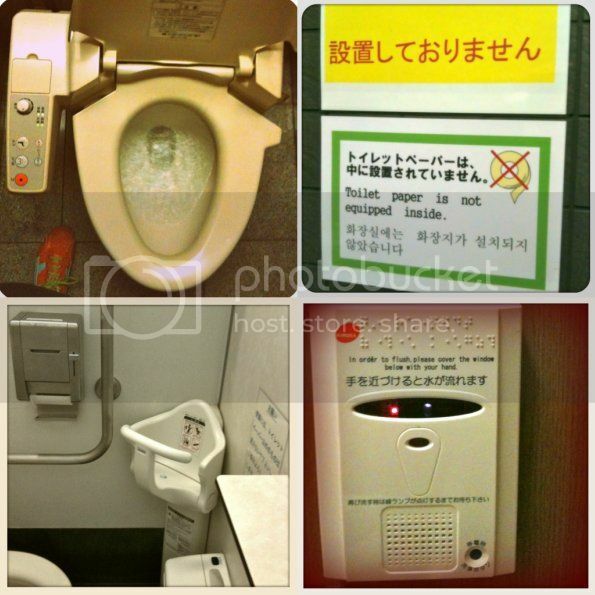 So that is Cinti's guide to Japanese toilets...and if you ever get stuck "Otearai wa doko desu ka?" means, Where is the bathroom? Here are some of the cute things I've recently listed in the shop. This update was colour themed around gelato colours. 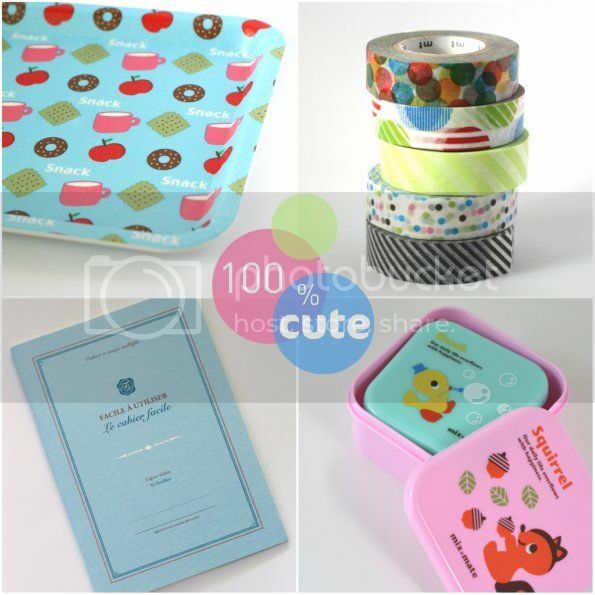 It includes some patterned washi tape, which you can buy as single rolls. Check out all the new stuff here. I am so super excited to tell you about my new sponsor this month CMUK...they make sneakers, really cool sneakers. I discovered them online before my trip to Japan, and thought they would be ideal for traveling as they pack down to nothing and are really really light. I'm so glad I took them because not only did I save a heap of luggage space, they were super comfortable too. 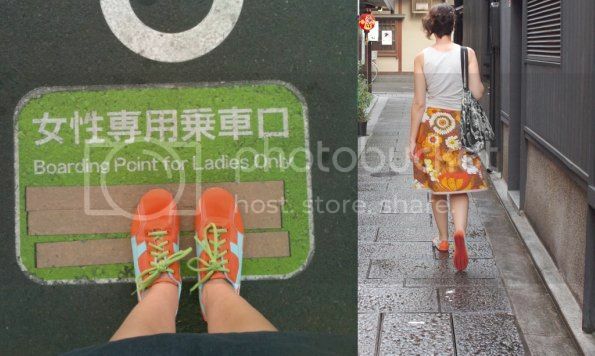 Here I am wearing my pair in Japan. It was hard to decide which colour to choose, I really love all the colourways, but I decided on my favourite colour, orange (looked cute with the skirt I made for the trip). It was really hot and humid in Japan and I wore them either without socks or with some light sockettes, because they aren't bulky my feet didn't overheat, which was good. The sneakers are designed to feel like you are walking barefoot which is great when you are on your feet all day, and because they don't have bulky insoles, those with orthotics can slide them right in. If they get a bit whiffy, just throw them in the washing machine, so practical! I could go on and on about how great they are...and did I mention they are really affordable? Yep, under $50, and there is a discount if you buy more than one pair. With kids pairs in the works, the whole family can have a cool pair in every colour! So be sure to check out the CMUK website, it's quite quirky, and has all the info you'll need to know about the sneakers as well as how to choose your correct size. It's the first time I have shopped online for a pair of shoes for myself, so naturally I was worried about the fit. But I followed the chart and found that they fit really well. The style is unisex so they have plenty of toe room to wiggle around in. Now to the really exciting bit, CMUK has kindly offered me 3 pairs of sneakers to giveaway! All you have to do to be in the running is pop over to the CMUK website and then leave a comment here telling me which colour is your favourite and where you would wear them. Just one entry per person please, we want every one to have an equal chance. If you are lucky enough to win you can choose your preferred colour and size from the 6 colourways. Thank you CMUK for being such a great sponsor, as a way to say thanks, be sure to tell your friends about this great Melbourne based company, and pop over and like their facebook page too. The fine print: competition closes Wednesday 20th July 7pm EST. Winners will be chosen via random.org and announced on the blog on July 21st. Winners will also be notified via email so please make sure you have e-mail enabled on your comments or leave an e-mail address in your comment. Giveaway is open to Australian residents only. Even though we'd love you to become a 'Liker' of our facebook page, entry is NOT conditional on becoming a 'liker' of the My Poppet or CMUK Facebook business pages. This giveaway is not affiliated with facebook in any way. I know you've all been keenly awaiting stories from the trip, there is so much to tell. My brain doesn't work chronologically so my posts will be in no particular order. Please Enjoy! Now my favourite thing about travelling (apart from getting to try yummy food) is people watching. It is always so entertaining just to stop and watch folks go about their business. The streets of Shibuya were filled with super hip people both young and old, and we spent many an hour sipping on iced tea watching the fashion parade that was 'Shibuya'. But spend a Sunday in Harajuku and Yoyogi park if you want to take people watching to the next level! 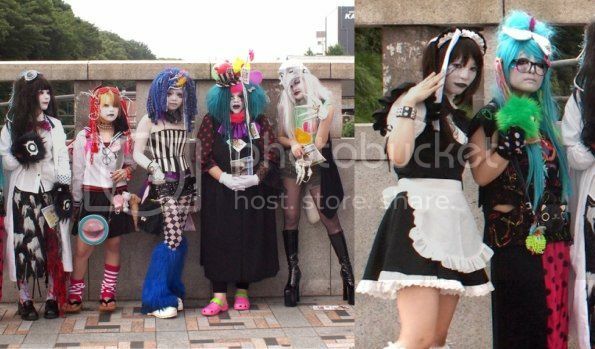 Harajuku is most famous for the teens that dress up in Cosplay. They hang about on the bridge between Harajuku station and Yoyogi park. They love being photographed and this group was surrounded by snap happy tourists and locals. Just after Pilgrim took this photo they were moved on by the police. I don't think the local authorities encourage their hanging about, and we didn't see any Cosplay devotees later that afternoon or the week after. I love that one of them is wearing crocs, gotta think about comfort first! 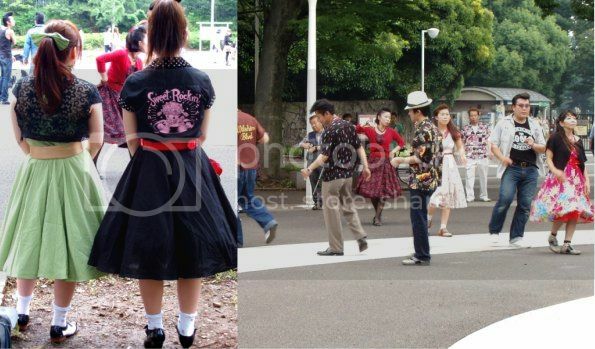 Walk over the bridge and into the park and there is a big area where Rockabilly fans gather and show off their dance moves. These girls looked super cute in rock n roll outfits. Some of their moves were pretty crazy, and the boys hair styles defied gravity! Because people live cheek to jowl in Tokyo, Yoyogi park is quite an oasis for the locals. As a park it isn't very impressive, we saw lots of unimpressed westerners (lol), but there is space, and I assume when you don't have a backyard or even a balcony, any open space with a bit of grass will do. There were lots of groups getting together having picnics, playing frisbee and ball games. Many trying to look cool playing instruments and doing capoeira, there was even an extreme skipping team! 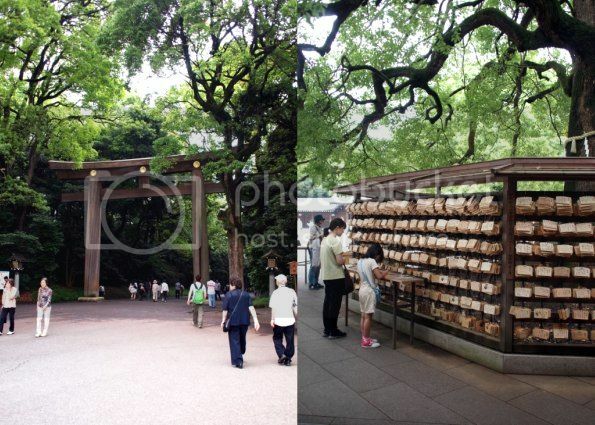 Trek a little bit further into the park towards the Meiji Shrine and the whole mood changes. The park becomes more wooded and the crowd more conservative. Older people and those with young families come and take respite from the heat under the green canopies and visit the shrine to make a prayer of offering. It was nice and quite there, a real break from the colour and crowds of Harajuku. I couldn't resist snapping a shot of this little girl dressed in a beautiful kimono at the shrine, I think her parents had hired a photographer to take her portrait and she was being a little uncooperative. Kids! Some of you that have been to japan will know that it's a shoppers' paradise. It's full of the most adorable everything, and the good/bad thing is that it is all quite affordable. Having been told this, I headed over with an empty suitcase. All of my clothing and personal effects were in a carry-on case that I packed inside the a fore mentioned empty suitcase. It took only a few days to fill, and there were some excess baggage charges to pay (oops!). I brought home a few things for Emma and I (Mr Man got nothin'), but the rest is all for you!! The little triangular bento boxes have already sold out, but I have more designs to list so hang tight! And get a load of this little pot of glue! I fell in love with this adorable character as soon as I saw him. This little yellow puppy dog with red cap is full of an eco-friendly cornstarch based glue/paste that has been used in Japanese schools and kindergardens since 1975. 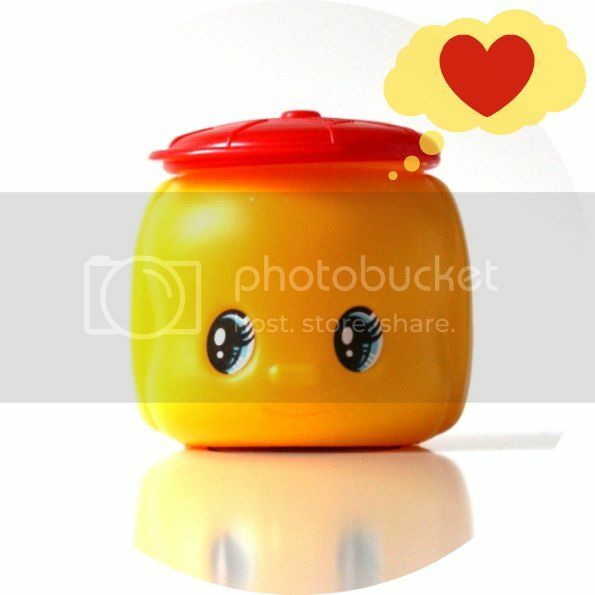 It's safe for kids to use and the adorable little tub can be used to store tiny treasures in once it's empty. I've only brought a very limited amount of each item home, so the listing will state how many are available. If you don't want to miss out on any of the coming shop updates, you'd best follow me on twitter or facebook to be the first in the know. The shop also has a fancy RSS feed button that will send you emails every time I add a new product. It's clever! So what do you think so far, did I do good? I'm really happy to introduce you to Jemma from Little Eats, a website with reviews on the latest and greatest kid-friendly cafes around Melbourne. After having her first child, Jemma didn't want to give up her foodie lifestyle...so Little Eats was born. Tell me about what inspired you to start little eats? A passion for food, coffee and cafes, an obsession with eating out and trying all the latest cafes and restaurants, a background in marketing, communications, advertising and writing, and a desire to not return to the corporate world or to put India in childcare. Being an ideas woman, I was constantly coming up with hair-brained schemes and business ideas, however the Little Eats concept just clicked. There didn’t seem to be much else around, and I thought it would be a great way to combine all my interests, do something for myself, and help other coffee-loving new mums at the same time. What makes a café a big hit for you? For me it’s a magical combo of the food, the coffee, the service and the decor, fit-out and overall vibe and feeling of the place. You usually know if a cafe has got “it” just by walking into the place. However for my little ones, a cafe that make great babycino’s complete with marshies, and has a fun new box of toys and books to discover, or crayons and paper on the table then that is a big hit for them. Bags Full and Miss Marmalade. Somers General Store is also one of my all-time faves. Have you always been a ‘foodie’? Yep sure have! Food, coffee, wine, cooking, dining out and entertaining have always been a big part of my life since I was a little one myself. My parents are big foodies too, and my Mum is a hostess with the mostess extraordinaire, and they live overseas and are currently eating and drinking their way around Europe (half their luck!). When we were kids we would always do Sunday brunch on Brunswick St (usually pancakes at The Fitz followed by a quick stop off for flowers at Vasette - can you believe they turned 21 this year! ), often go out for dinner to all kinds of places all over town, visit lots of wineries and were constantly hosting dinner parties and BBQ’s etc. Their love for good food definitely rubbed off on me. My husband Van is in the hospitality/wine industry too and his father was a chef. So food is a huge part of our life then and now and now for our kids too. I think little India has been to more cafes and restaurants in her first to years of life than I did in my 10! How has your dining out experiences changed now that you have kids? The Little Eats concept has been around pretty much since India was born (she is now 2 1/2), so we have been out and about at cafes A LOT as it is all in the name of research of course! We still eat out heaps just as we did before kids, I guess just the types of places have changed now. We don’t really go out for boozy dinners any more where we would easily drop a few hundred bucks a night. We often go out for dinner somewhere cheap and easy on a Saturday night eg: Binh Minh for Vietnamese in Richmond. We all love pizza too and are big fans of Motorino and Mr Wolf. But mainly we are out on the weekend for brunch and lunch doing reviews for Little Eats or catching up with another family. You are a mum of two, how do you juggle work and mothering? India is 2 1/2 and Aurora is 14 months, so they are 17 months apart. Hmmm juggling.... that is the story of my life. I don’t know how I do it... I just do it! I do love being busy though and wouldn’t have it any other way. :) Lots of late nights too! I notice you travel to Bali a lot, is a little eats Bali on the cards? I wish! I would love to live there and just eat and drink and lie in the sun by the pool working on my laptop all day! Thanks for doing all the leg work Jemma. It's great having a website like yours where I can check out the best cafes in the area before I head out. You've suggested a heap of places I haven't had a chance to visit, I'll have to make sure they are on the itinerary next time we are out for brunch. Little Eats has been such a supportive sponsor of My Poppet, so show your support and visit them soon. Keep up on the latest reviews and giveaway news on the Little Eats facebook page. Visit the Little Eats website here.